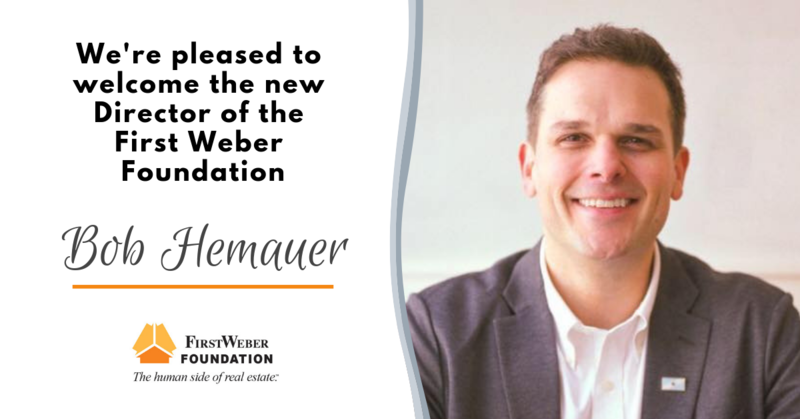 First Weber is proud to Welcome Bob Hemauer as the new Director of the First Weber Foundation! Bob comes to the First Weber Foundation from a varied background with extensive experience with non-profit organizations. In addition to his work with the First Weber Foundation, he serves on the Boards of the Wil-Mar Neighborhood Center, Madison Parks Foundation and as Director of the non-profit Makeshift Festival. He moved to Madison in 1996 and since that time, been a small business owner, sommelier, non-profit board member as well as “barely-capable” Honky-Tonk bass player. He’s looking forward to meeting everyone, and is really excited about the opportunity to harness the collective power of First Weber to have positive impacts in communities around the state. When he’s not doing non-profit stuff, he’s super-into wine & food, travel & analog photography. Please join us in welcoming Bob! See more about the First Weber Foundation . The First Weber Foundation donates to eligible 501(c)3 organizations that benefit communities statewide.